We have discussed before how regional (commercial) banks have been ‘upping their game’, investing in talented e-commerce people, enhancing their back-end pricing technology and importantly investing in new client facing single-dealer platforms (SDPs). As a result of this focused investment, regional banks have been steadily gaining market share, sometimes at the expense of the large global banks as they deliver ever greater value to their client franchise through their SDPs. 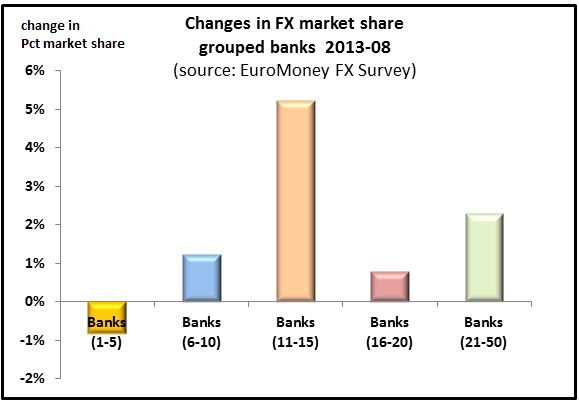 This trend can be clearly seen in the chart below, which contrasts the change in FX market share of groups of banks using the EuroMoney FX survey data between 2008-2013. Although regional banks lack the huge investment budgets of the top-tier banks, many are nevertheless able to roll out new intuitive and well designed SDPs based on modern web technology far faster than the top-tier banks, and at a fraction of the cost. Caplin’s SDP solutions are enabling many regional banks to roll out their new SDPs at breakneck speed, reducing overall time-to-market for an FX single-dealer platform from an industry average of 1-2 years to, typically, 3-4 months, and reduces the cost by 75% or more. 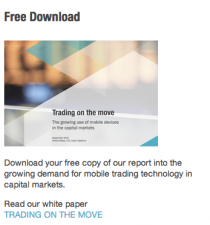 We are therefore extremely proud that our contributions in this space have been recognised by FX Week, who have just announced that Caplin are the winner of their eFX award for the “Best trading technology vendor” for 2014.